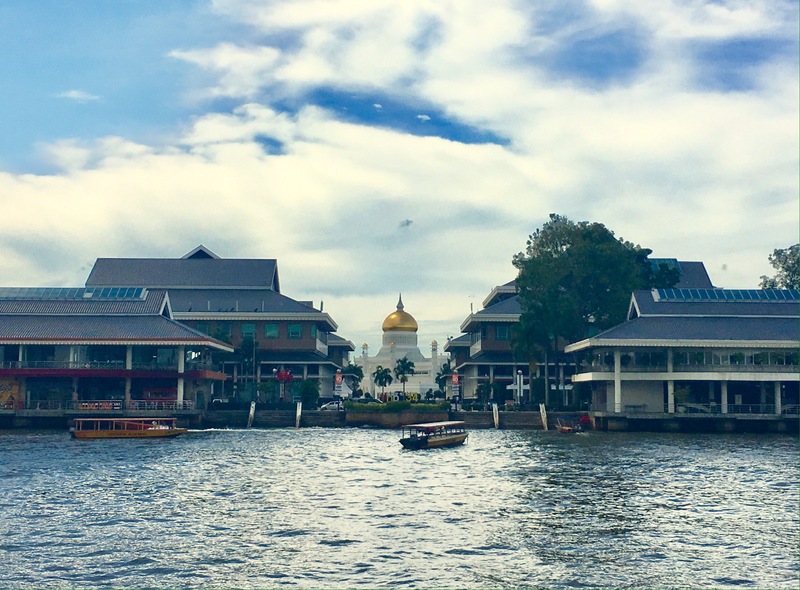 To those who haven’t been to this tiny sultanate in the island of Borneo, the mention of Brunei Darussalam may evoke a sense of mystery. Or elicit curiosity for being the kingdom of a man who at one point was the richest in the world. But for me and my family, Brunei was simply home. As our plane approached for landing, my first sight of this strange, new place was that of the warm golden glow of the street lights dotting the labyrinth that was its capital city. It was a strange sight for me as in those days, the country that my mother, sisters, and I had just left behind still only had those antiseptic-white fluorescent bulbs to light our way. It was a cool, crisp December evening. I remember it distinctly, this much-awaited holiday reunion with my father in our new home. It was to be our home, in fact, for almost 5 years. And as I opened the door to our silver Nissan Cedric, the sweet aroma of tropical fruits wafting through the air, a vaguely familiar sound suddenly hit my ears. It was ABBA. And the year was 1979. The only other time I returned to Brunei was in 1989 after graduating from college. We had spent the summer with my parents who were still based there and I thought it would be the last time I’d ever see it. Project manager for the government on His Majesty the Sultan’s special projects, my father and his team were working on the ICC complex when I visited in 1989. Fast forward to almost 30 years later when I received a message from my dear cousin whose family had stayed on, inviting me to her wedding. A Muslim wedding in Brunei, I thought. That definitely sounded exciting. Perhaps it was time to go back to the only other place I’ve ever really called home. So I immediately booked an airline ticket and, well, this is where the next part of my story begins. 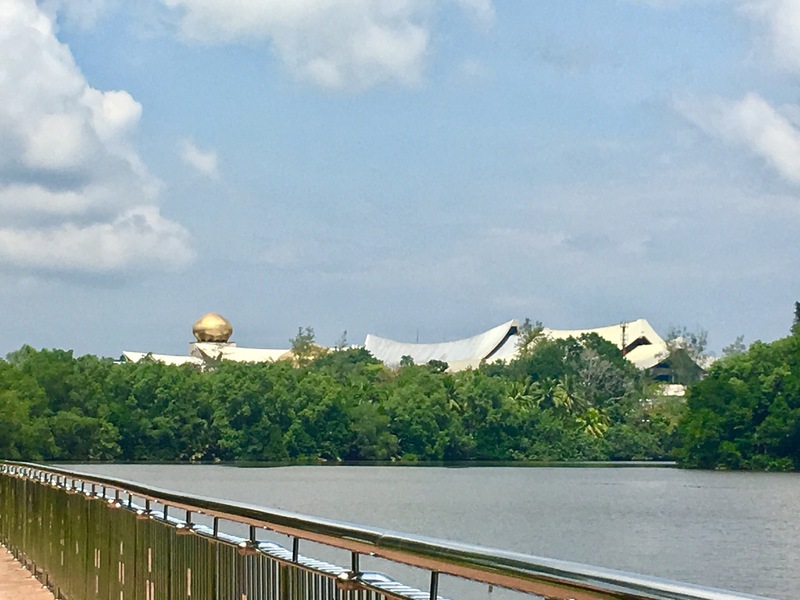 The approach to downtown Bandar Seri Begawan from the ever-present Brunei River. This trip had been a long time a-coming. Back to the country I’d spent many happy years as a young teen. It was an idyllic time (pre-gadgets, need I say more?) in an equally idyllic setting. As most expat families would probably be able to relate to, living away from all things comforting and familiar forces any family to stick together, to become a stronger unit in this strange, new, scary, exciting life everyone has to navigate through. And hopefully, together. As was the case on the very first night I laid eyes on Brunei, I again arrived to a sea of warm, golden lights. This time, however, there was no ABBA music to greet me. Just the pitter patter of raindrops on the windshield as the ride to my hotel passed places I still recognised. Thoughts of rainy December nights on Christmas seasons past when we still lived there suddenly came flooding back and before I knew it, we were in the hotel that was to be my home for the next few days. Well, that was fast, I thought. Then remembered that one of the best things about Brunei, and which still stands true to this day as I happily learned, is that everything seems to be just a 15- to 20-minute car ride away. Give or take. The beach was a mere 20-30 minutes away from either downtown Bandar Seri Begawan, Brunei’s capital, or where we had lived (near the National Stadium). The farthest beach was in Kuala Belait past the Brunei Shell Petroleum headquarters in Seria, a 1-1/2 hour drive from BSB. Still not too bad. Being this close to the water was great because Brunei can be extremely hot as it sits closer to the equator. We girls would just get in the car (no major production required), then head for the beach for a swim or bring out our small jet ski and ride like the wind! Some things have changed, however. Gone are the days…. …when snakes could be readily seen crossing major roads or, heaven forbid in today’s world, receiving a baby gibbon as a gift from local Iban tribesmen (maybe it was just us, but different times indeed). 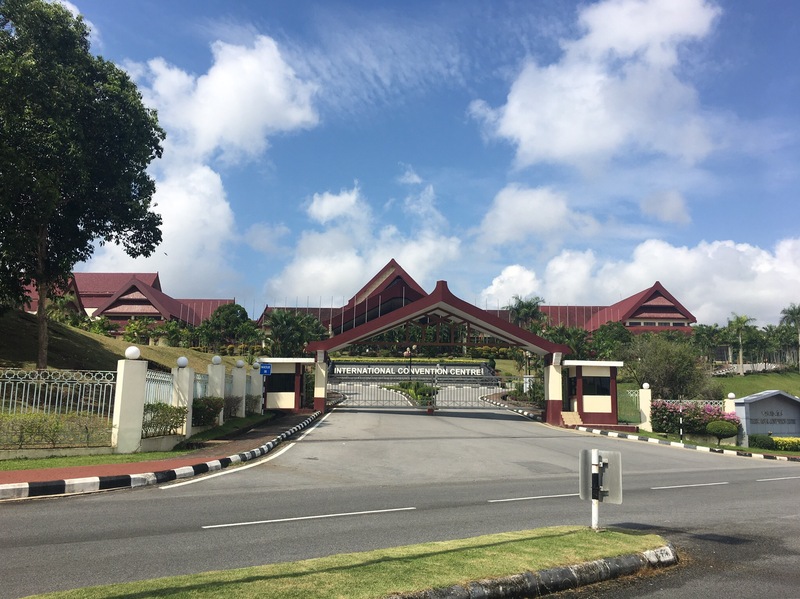 …when The Royal Regalia Museum, which houses the coronation and other royal paraphernalia of His Majesty Sultan Haji Hassanal Bolkiah and the Royal Family, was once The Churchill Museum honouring, you guessed it, Winston Churchill. Converting this building into The Royal Regalia Museum was one reason for my father’s return to Brunei. 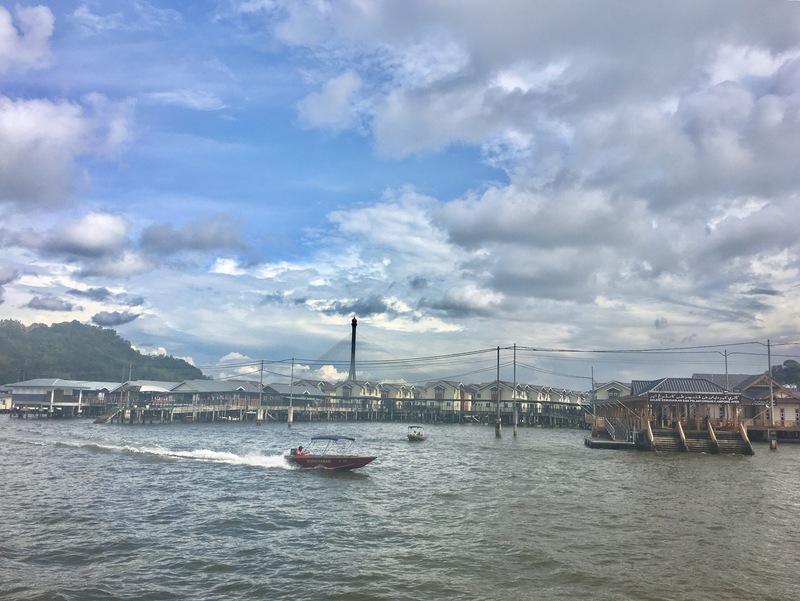 …when the historic Kampong Ayer or Water Village, the worlds’s largest settlement on stilts, still floated atop ancient wooden stilts instead of the now-modern concrete ones. Strengthening what was once ancient wooden stilts on which the historic Kampong Ayer stood for many generations was definitely reason enough for my father to remain. …when the place to get the best steamboat was in Ang’s Hotel (now Terrace Hotel) and for reliable Chinese food, one could only go to Lucky Restaurant (the lemon chicken and fresh orange juice were to-die-for!). …when department stores like Klasse and, later on, Yaohan were around, which along with Fitzpatrick’s supermarket seemed to have absolutely everything we needed under one roof. …when Jerudong Park was simply a place we could go to in the afternoons during polo season to watch, well, a polo match rather than for the amusement rides or the Empire Hotel, which the area is more popularly associated with today. The old Filipino community of mostly professionals who blazed the trail in Brunei for those who came after like my father and welcomed our family when we first arrived are no longer there. But the warmth and friendliness of the local Bruneians are just as I remembered. Always ready to help, they truly are some of the kindest, giving people I know. Which is why it’s always so difficult to leave! Fortunately, too, the same activities that showcased the natural beauty of the country or things that I missed the most about Brunei are still around. Let me begin with food. There’s a host of restaurants that serve international cuisine, but Brunei’s cuisine is primarily Malay. So you’ve got the rendangs, the nasi (rice) and mee (noodle) dishes, satay (still can’t forget my first one at a street stand near the old Klasse department store), sambal on the side, and roti to wipe up all that sauce. But the one closest to my heart is actually a snack, and no one makes it quite like Brunei does: keropok udang. 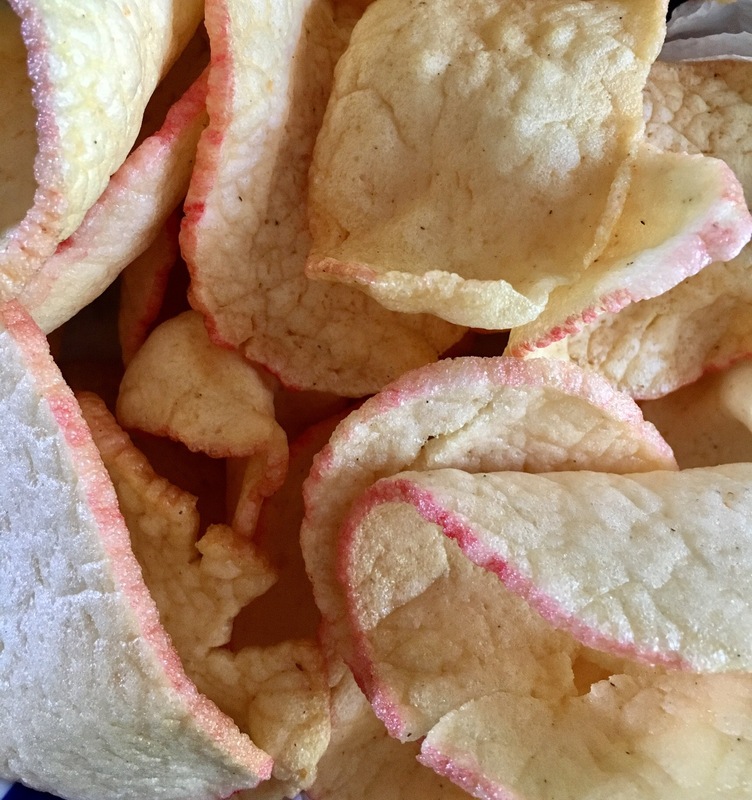 Those deep-fried prawn crackers made of starch and secret spices you probably wouldn’t want to know about. But man, I’m so glad they still make ‘em like it’s no one’s business! All the golden, crunchy goodness of Brunei’s keropok udang just ready to be had! We get ours from a second-generation family of keropok makers who’ve thankfully continued the tradition. Call me sentimental but I actually missed hearing the Azan or the Muslim call to prayer. Yes, even the pre-5am call before sunrise which, after a while, I seemed to have gotten acclimatised to that it eventually failed to awaken me. I am a practicing Catholic and I do love the sound of church bells. But I also think there’s something just beautiful about the melodious sound of a human voice hailing from a minaret, calling the faithful to worship. The biggest in the country, the Jame’ Asr Hassanil Bolkiah Mosque can accommodate up to 5,000 worshippers at any given time. Yet another reason my father stayed on in Brunei. Another thing I marvelled at on this visit is its ever-present lush vegetation. Brunei is still 70% raw rainforest, with at least 55% of the country’s total land area protected. And Brunei is bigger than Singapore with a population that’s seven times less (only slightly over 400,000), which partially explains the abundance of greenery. There are, however, efforts to increase tourism in the country to help lessen its dependence on its oil industry. Dubbed the “Green Jewel of Brunei”, the Ulu Temburong National Park is the country’s nature paradise. Think of waterfalls that you can walk underneath of, a canopy of trees so thick you can marvel above them while walking on a suspension bridge, and wildlife that’s unique to the jungles of Borneo. Temburong, however, is separated from the main part of Brunei by a slice of Sarawak Malaysian territory, which Brunei decided not to fight for in order to maintain peace with its neighbour (did I mention “Darussalam” means “abode of peace”?). 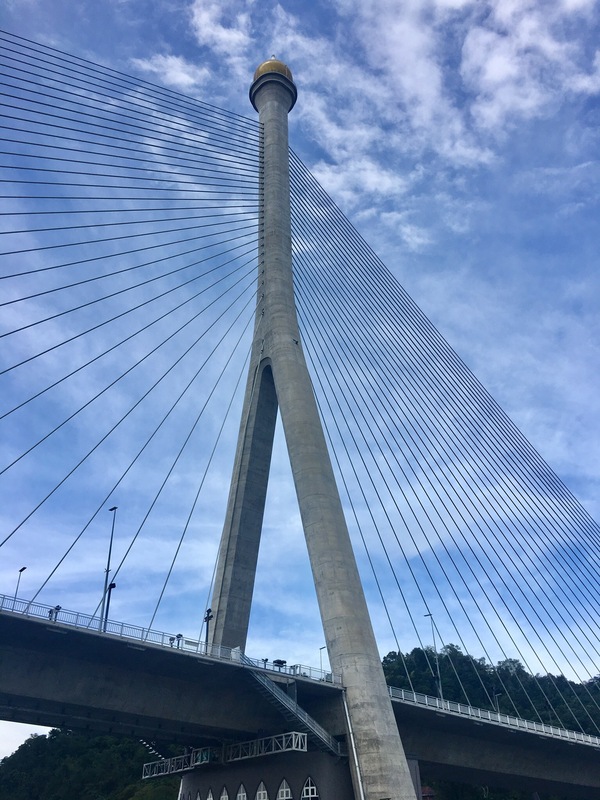 The construction of a major bridge to connect the two is under way and is set to open in 2019. 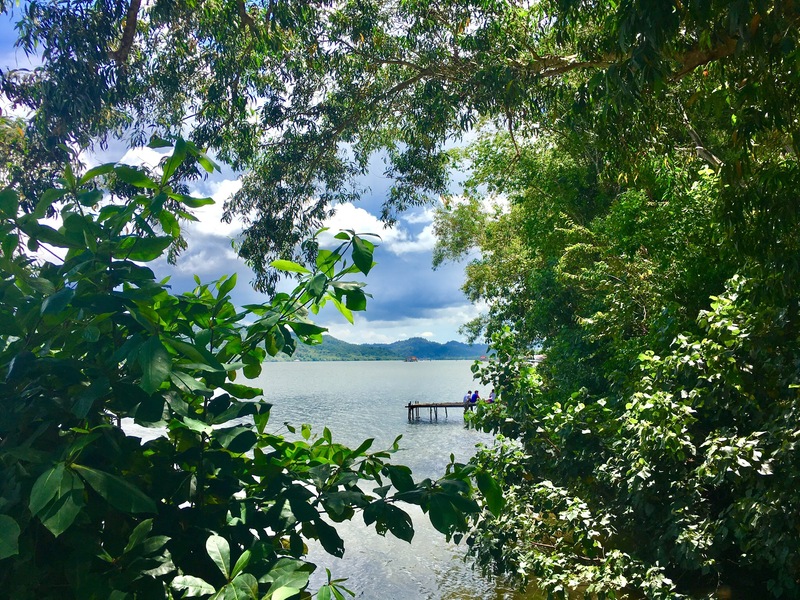 This would shorten the trip between the two areas from the present 45-minute ferry ride, which takes one through the mangroves of Borneo, to a mere 20-minute drive by car. I have to say, though, going through the mangroves can be a powerful experience on its own. Admittedly, a little unsettling for a city girl like me (though this was many years ago on a small boat, I remember it vividly as if it were yesterday), but once I got over my initial discomfort over just being around such forces of nature as the mangroves and the wildlife, I was fine. 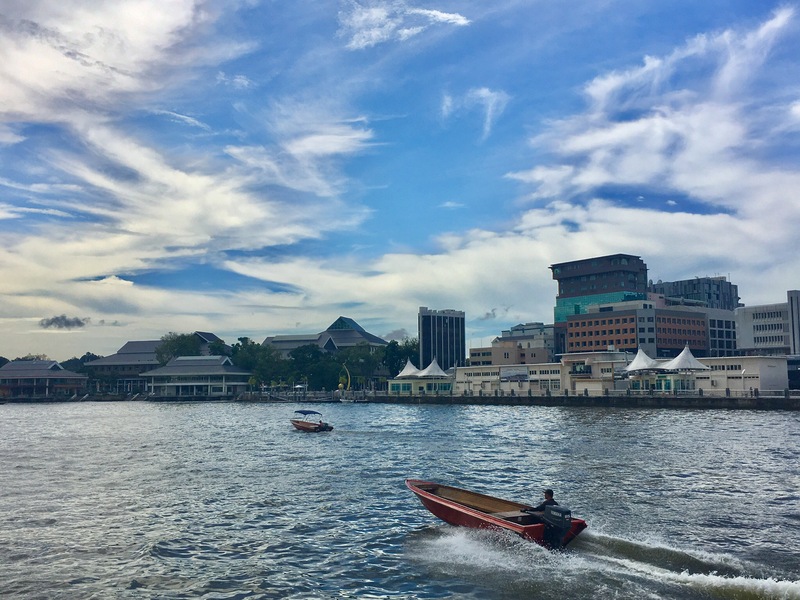 If you’ve got limited time, however, at least take a cruise along the Brunei River. I’m so happy my cousin, Mary Ann, and her then-betrothed now-husband, Oggi, gifted their wedding guests with an afternoon tour along the river. It was practically a cruise down memory lane. I also used to love going to the Brunei Museum in Kota Batu near the river tour jetty, but it looked eerily closed when we went past it. Otherwise, I would’ve recommended a stop there for a proper introduction to Brunei prior to the river tour. A bridge named after Her Majesty Queen Saleha, it is the first of its kind in the country. The Hari Raya celebrations after Ramadan was something we all looked forward to. We’d go from one house to another to greet our Muslim friends, then partake of some of the most delicious delicacies that only appear during that period. But the pièce de résistance, if you will, of the Hari Raya celebrations is undeniably still the chance to shake the hand of His Majesty the Sultan as the palace opens its doors to the public. Fortunately, we got to do it when we were living there. Nowadays, however, only male guests get to shake the hands of the male members of the royal family, while only female guests can shake the hands of Her Majesty (the Raja Isteri) Queen Saleha and the other female members of the royal family. 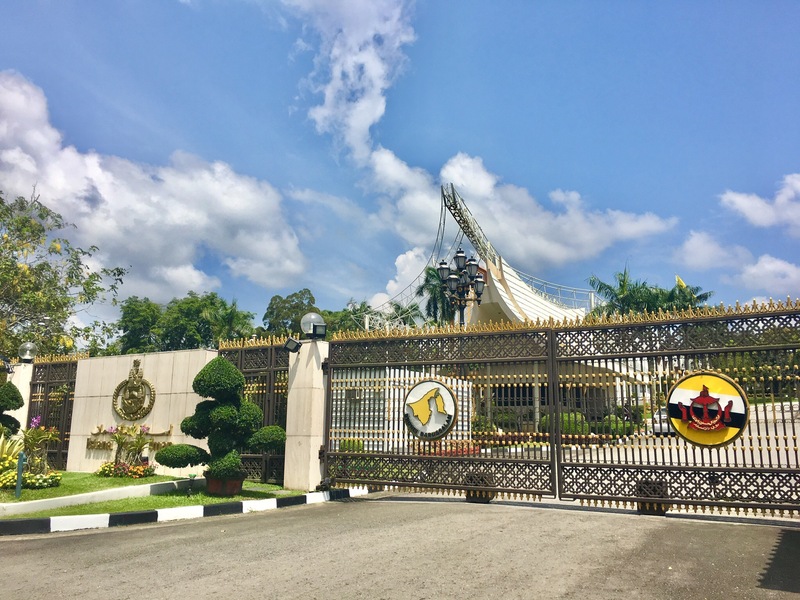 Well-wishers and guests during Hari Raya celebrations enter through this gate to experience an open house of amazing proportions, held in what’s dubbed by the Guinness Book of Records as the biggest palace in the world (and why my family moved here in the ’80s). A visit to the open-air Gadong Night Market would be an interesting way to try out some local food. It’s near a shopping building called The Mall, but I’ll be honest with you: there’s a reason why Bruneians still fly to nearby Singapore, Kuala Lumpur or even Manila for some serious retail therapy. I heard, though, that things are about to change as plans to relaunch the Yayasan Commercial Complex as a place for luxury shopping is in the works. 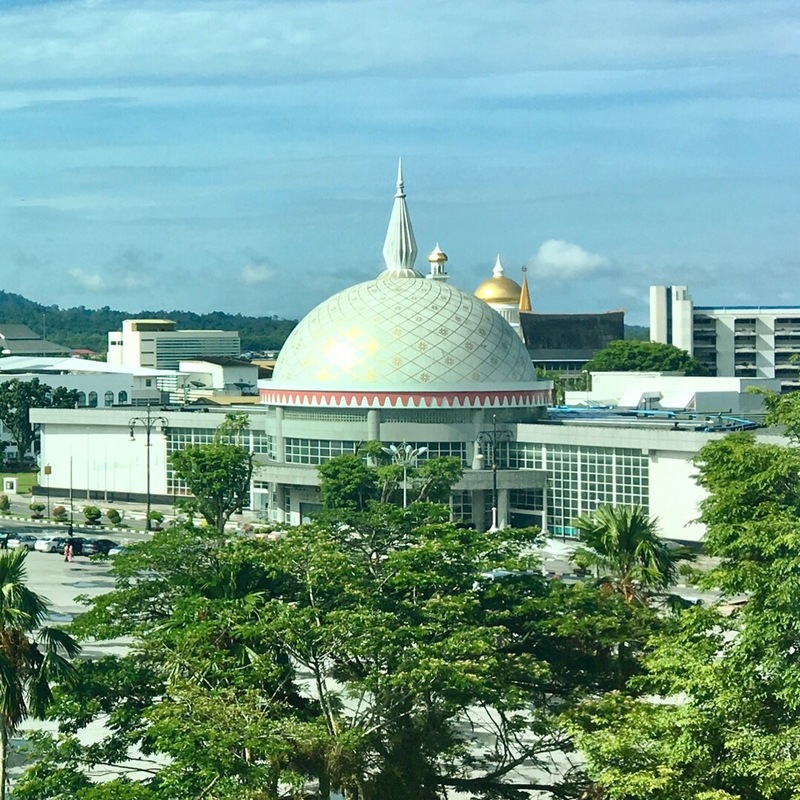 The iconic Omar Ali Saifuddin Mosque flanked by the Yayasan Commercial Complex, the last project for His Majesty the Sultan handled by my father before finally coming back home to the Philippines. Where to stay? The location of the former Sheraton hotel – now the Radisson – is still the most central, and the Avis office is located right within the hotel building. Although from there, it’s an easy walk to downtown BSB anyway. Generally in Brunei, however, one will need a car – by either renting one, getting a taxi, or hiring a driver service. Save for when there’s an accident, at least traffic is a non-issue here (everything’s 15-20 minutes away, remember?!). I actually learned how to drive in Brunei. Around the Stadium complex near our home, in fact, in my father’s manual-transmission, right-hand-drive, boxy Fiat Strada. And for kicks, I’d also drive his old 1930s Fiat Topolino. It was so old I remember how anxious I’d feel driving it across the main road from our house to the stadium as it rather went a tad too slow for comfort. But it sure was a hoot to drive! The Malay word for independence, merdeka is a fitting word to remember Brunei by. A full British protectorate since 1906, the country gained its independence from Britain in 1984 and our family was lucky to have witnessed such an historic event. On hindsight, we probably lived in Brunei at a time when its population was the most global in composition: the British were still around and the palace project, which my father headed orchestrating 5,000 people from 30 nations, was in full swing. Istana Nurul Iman. The palace that changed our lives forever. That period also marked the beginning of travels around the region and beyond for me and my sisters, and our exposure to different cultures meant tasting different types of food, observing a wide array of customs, and gaining an appreciation for faiths other than our own. Sure, I may have missed out on the high school parties of my generation (a prom? what’s that?) and I may have grown up differently from most of my friends back home in Manila, but I know I wouldn’t have wanted it any other way. Because what Brunei gave to this impressionable teen was so much more. It opened my eyes and my mind to the different possibilities, smashing whatever walls were beginning to build up around me. 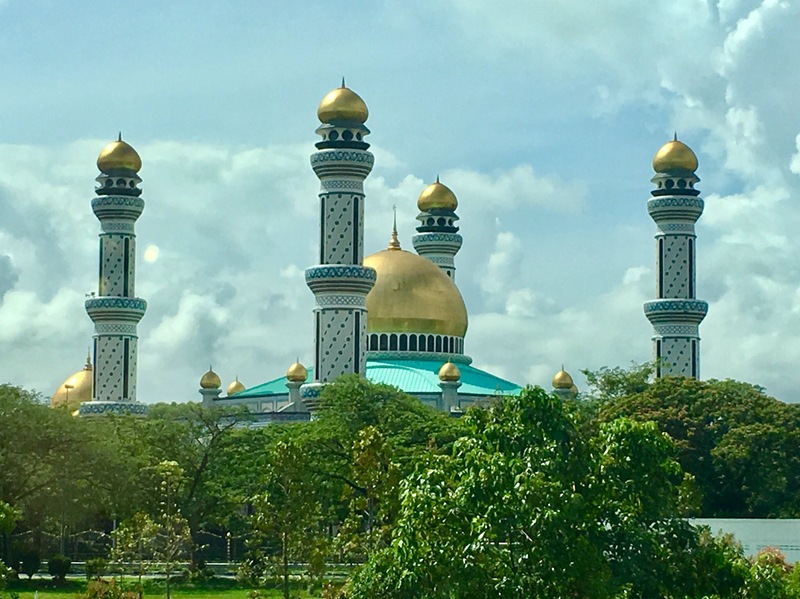 As ironic as it may seem to have gained all these in a conservative Muslim country, living in Brunei taught me the values of tolerance, acceptance, and definitely helped shape the person I am today. Itchy-feet, curiosity-seeking, travel-hungry me. All because Brunei gave me a taste of the world. Thank you for sharing. Made me travel back in time! Brunei’s not exactly a place one read all too often about. Thanks for taking us there! I almost work in Brunei (office) in my early 20’s but it seemed not meant to be… long story. It never stop me thinking what will my life be if I did and where will I be now haha!